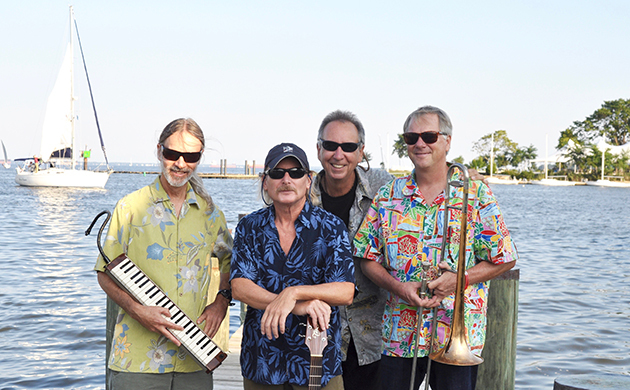 The Eastport Oyster Boys are bound by their love for music, but more importantly, by their love for the Chesapeake Bay. Proclaimed the official Musical Goodwill Ambassadors for the city of Annapolis by Mayors Ellen Moyer and Josh Cohen, The Eastport Oyster Boys’ music cele ates the joys of life on the bay. Kevin Brooks, Andy Fegley, Tom Guay, and Mike Lange have poured their talent and energy into their songwriting, musical arrangements, and vocals for over twenty years. Their three albums Full Moon Cruisin', Miss Lonesome, and An Oyster Boy Christmas cele ate the history and culture of their Chesapeake home. As one might guess, The Eastport Oyster Boys prefer to be as close to the water as they can get. Once a year, they will host a Sail-In Concert on Shaw Bay where they take to the water and play a live show. All proceeds from the event benefit the Midshore Riverkeeper Conservancy, which helps protect and improve Maryland’s rivers. The Boys will be playing the at the Avalon Theatre's Stoltz Listening Room on Friday, October 20th, 8 p.m. Tickets are $20. If you love hot crabs, cold beer, and all things Maryland, this is a show you don’t want to miss! 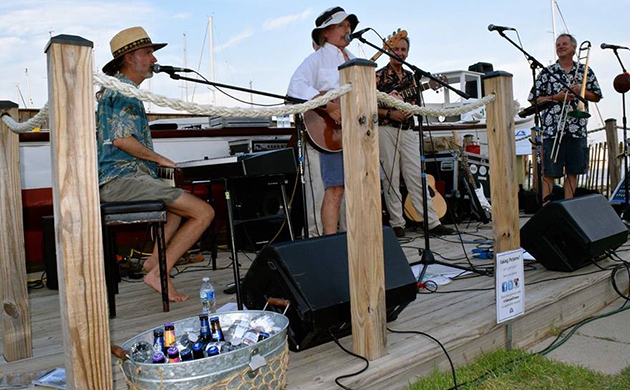 The Eastport Oyster Boys have been called the Musical Goodwill Ambassadors for the city of Annapolis. What inspired you to focus your music primarily on life on the Chesapeake Bay? Being the Musical Goodwill Ambassadors for the city of Annapolis is an honor and responsibility we take very seriously. We focus on stories of the Chesapeake because it’s such an inspiration. We love spreading the good cheer and beauty of this area. It’s inspiring from sun up to sundown and all the times in between, just by its beauty and natural elegance. Boating is what we do here. Crabs, old bay, and oysters is what life here is about. What’s not to sing about? You recently hosted your annual Shaw Bay Sail-In Concert to Benefit the Midshore Riverkeeper Conservancy. What's it like playing a concert in the middle of the water? It’s inging all the fun and forces of nature and music and together. We’re singing about the bay on the bay. We had over 100 boats there and the weather was gorgeous. A lot of concerts have a mosh pit, but we have a slosh pit. People were splashing around, passing food and drinks back and forth. Everyone looks forward to this concert, especially The Oyster Boys. The concert is always the Saturday after Labor Day, and it’s a heck of a lot of fun. We all go by boat and make a long weekend of it. Has there been any specific performance or instance throughout your career that you'll always remember? Oh, it’s almost hard to narrow it down. I’d say top drawer was last summer when The Oyster Boys were honored to play for President Jimmy Carter and his wife, Rosalynn. That was quite an honor. Playing for Jimmy Carter was special. We had worked with his people probably for about four months before the event. It was not publicly announced. It was a private event for President Carter and 300 of his closest friends. Before the event, I asked the staff if the band could meet President Carter and his wife, and they said they would try to arrange that. It was a beautiful show on the Eastern Shore with a big crab feast. It was wonderful. Right after our eak, we see the big guys with the squiggly things in their ears coming towards us and we knew what was happening. So, President Carter comes up to us and says “Would you boys mind if Mrs. Carter and I had a picture taken with you all?” I mean, how unpretentious can you get? The band melted. I have tears in my eyes just talking about. How did the Eastport Oyster Boys come to be? It happened way back in the last century, 22 years ago in 1995. I had been playing in the folk circle here in Maryland and playing the Irish circle in Washington, D.C. I spent a little time with the band, Crab Alley, in their last days. They were one of the popular bands in the folk scene. Jeff Holland and I were asked to perform on the Schooner Woodwind, and that was our first gig, and we’ve been going ever since. Jeff has since retired from the band, but The Oyster Boys are still going strong. We are sharing our passion and soul, and we are sharing the truth about being a part of this community. A lot of musicians sing about love and loss, we sing to share the love for this place we call home: the Chesapeake. Sharing it with others and seeing them catch the passion is why we love to do it. If you had to describe each person in the band using one word, what would it be? Well, Tom Guay and I have been playing together since 1974. I would say his word is “spirit”, because he lives the music. Mike Lange is an extremely talented keyboardist and composer, and a great boater. He is our conscious. He keeps us on the straight and narrow. Andy Fegley is our trombone player and percussionist. He is the energizer. We call him the energizer bunny. Andy is like a wind-up toy, he can’t stand still on stage, he’s bouncing all over on stage. You've performed in various venues all over Maryland. Do you have a favorite venue to perform at? If so, what makes that venue special? What's next for the Eastport Oyster Boys? On October 20th, we will be playing at The Stoltz Theater. The fun thing is that we will be recording a live album that night. We are looking forward to having a packed room filled with people coming to enjoy song and story.